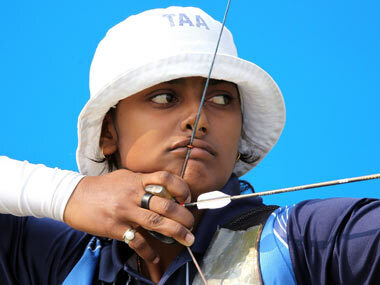 Till Stage 3 of World Cup 2013 for Archery Indians have made comparatively good progress. Here is the complete list of their achievements so far till Stage 3 in 2013. Recurve Mixed team finished second. Women’s Compound team of Gagandeep Kaur, P. Lily Chanu, and Trisha Deb finished third. Mixed Compound team finished second. WON Recurve Team event as Rimil Buriuly, Deepika Kumari and Bombayla Devi defeated Chinese in the final. Men’s Compound Team of Rajat Chauhan, Ratan Singh and Sandeep Kumar finished third at Stage 3 at Medellin. Recurve Mixed team finished third. Men’s individual compound: Rajat Chauhan is placed 6th. Women’s individual compound and Men’s individual recurve: No Indian in Top 10. 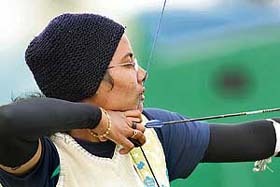 Women’s individual recurve: Deepika at No. 4. Mixed Team Compound: India is joint 4th with South Korea and Denmark behind Italy, USA and Mexico. Mixed Team Recurve: India is joint 4th with South Korea behind China, USA and Mexico. India is placed 6th with 218 points. USA (592), South Korea (583), China (280), France (245) and Italy (234) complete the top 5.